Living large in a double-wide! Fall flowers on the front deck! 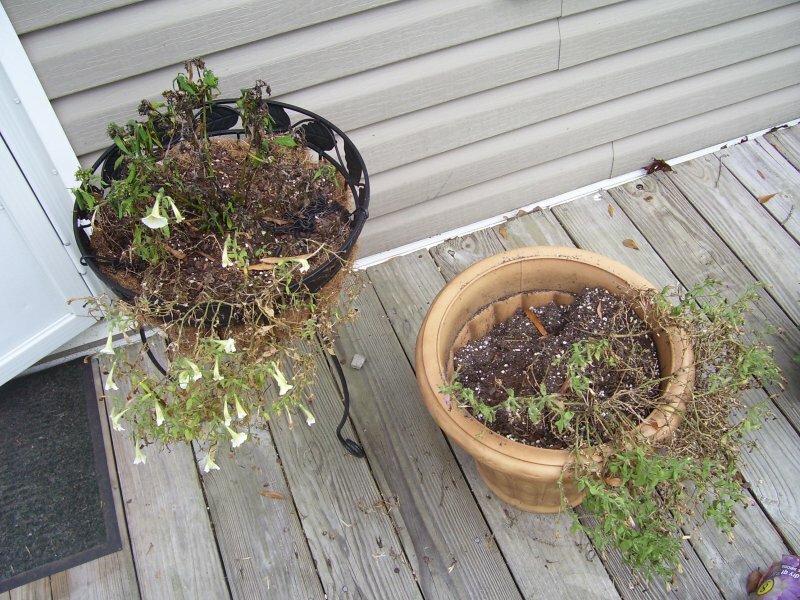 Last time I showed you my sad-looking front planters (the day I mulched the garden). 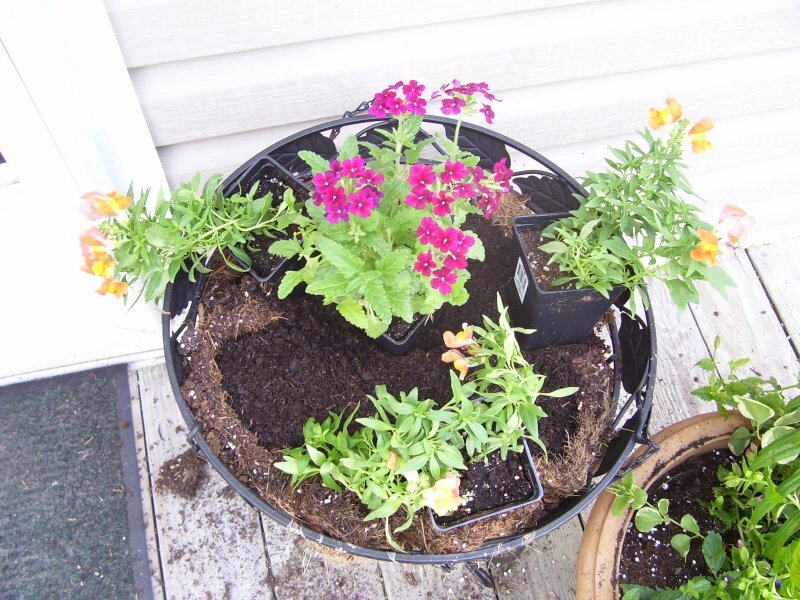 A week later, they looked even more pathetic, as the summer petunias had almost completely died out. It was time to put some color on the front deck! The first order of the day was to pull out all of the dying plants, making sure I got all the roots. 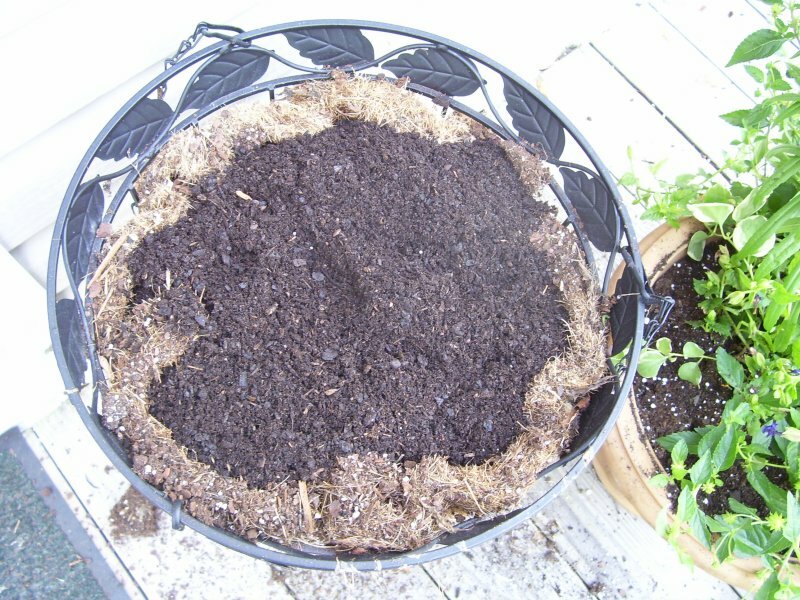 The pot on the right-hand side in this picture is quite deep (about 16″), so I intended to leave some of the original dirt on the bottom third, adding new soil to the top and mixing it with the old before adding plants. 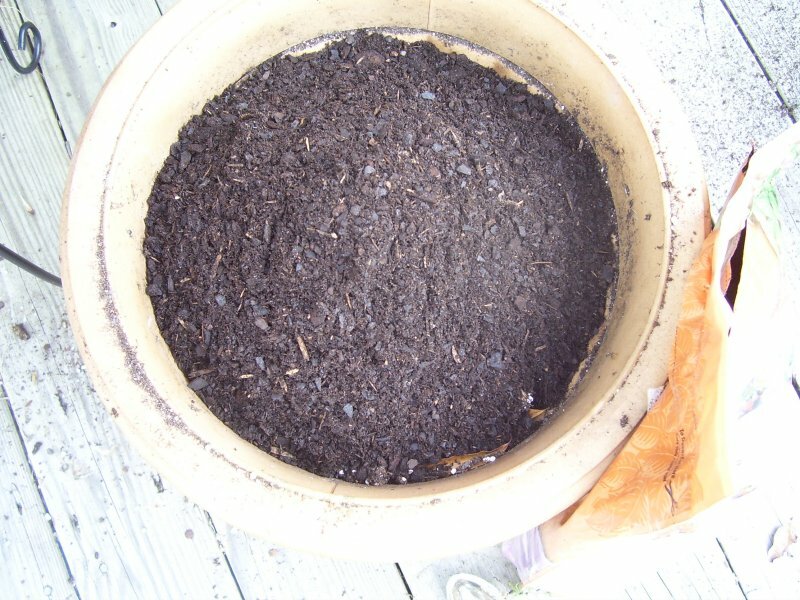 The day I did our grocery shopping, organic potting soil was on sale at two 10-pound bags for $5, so I grabbed two bags. Wal-Mart had a good selection of fall annuals on sale (I started rather late, so many of the annuals were half off). The fiery orange flowers at the back are snapdragons (a favorite with my children). The deep fuschia flowers did not retain their little identifying tags, and I am not sure what they are, unfortunately! They look like miniature asters. The two pots at the front contained a mixture of trailing plants and one tall, spikey flower that I also cannot identify. Anyone who knows what I have, post a comment! I love to learn! Here’s a closer shot of the snapdragons and the deep fuschia flowers. I love these! 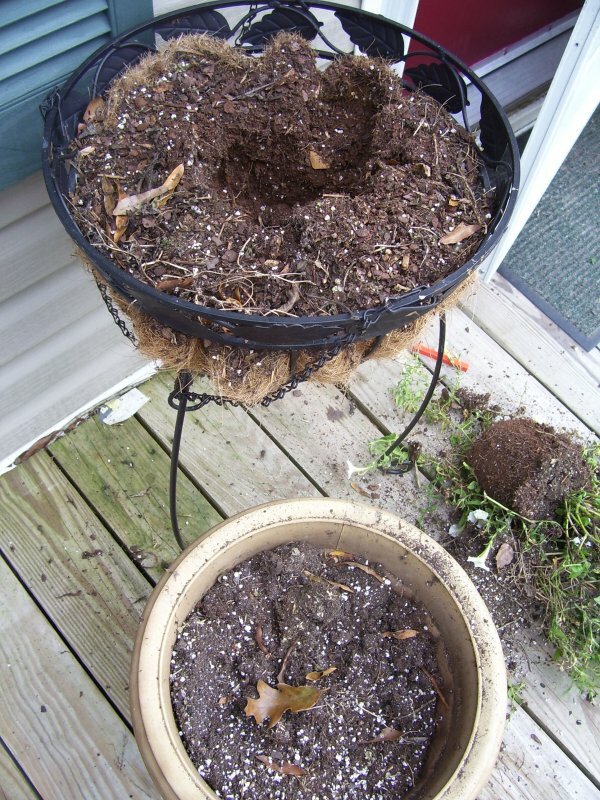 Here are the pots with the new soil mixed in. Rich! 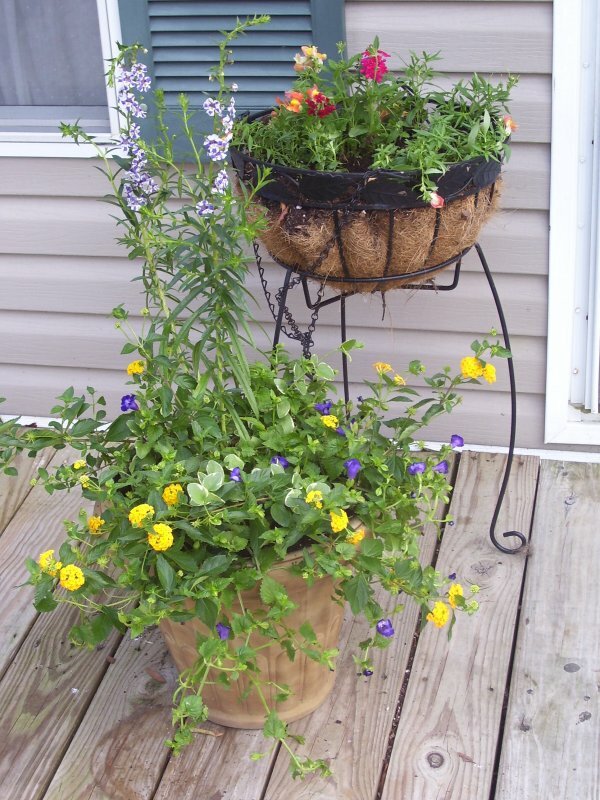 I placed the deep fuschia flowers in the center of each iron basket , then surrounded the edges of the basket with the snapdragons. 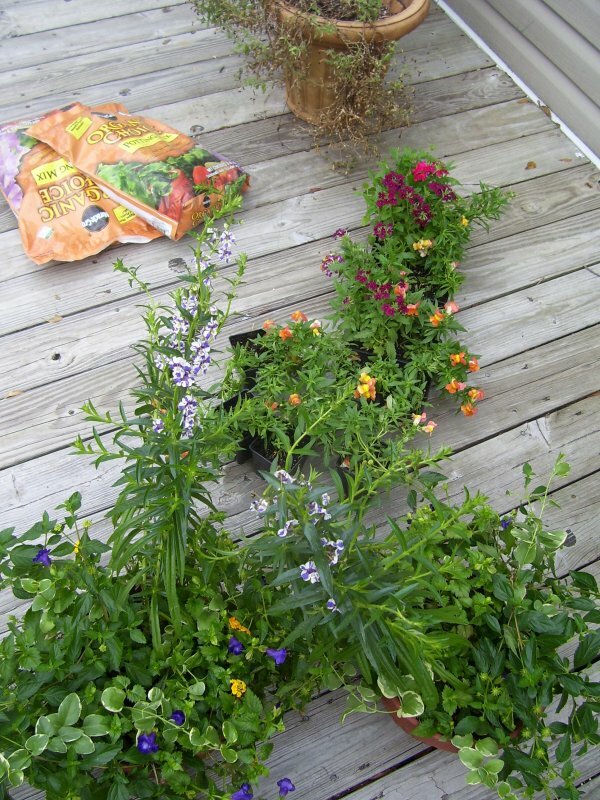 In this photo, you see the plants still in their plastic containers. I did this just to see how many flowers would fit comfortably. I had some snapdragons left over, so I planted them in my front rose garden. 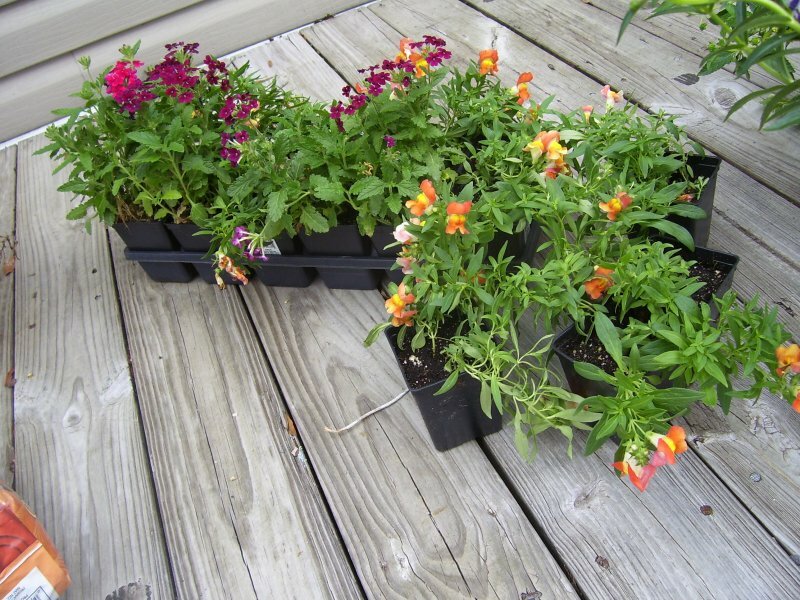 I’ve discovered that snapdragons are actually perennials in my region of the South because of our long growing season. At my old house, they came back yearly, bigger and brighter every year. I can’t wait to see what they do here! 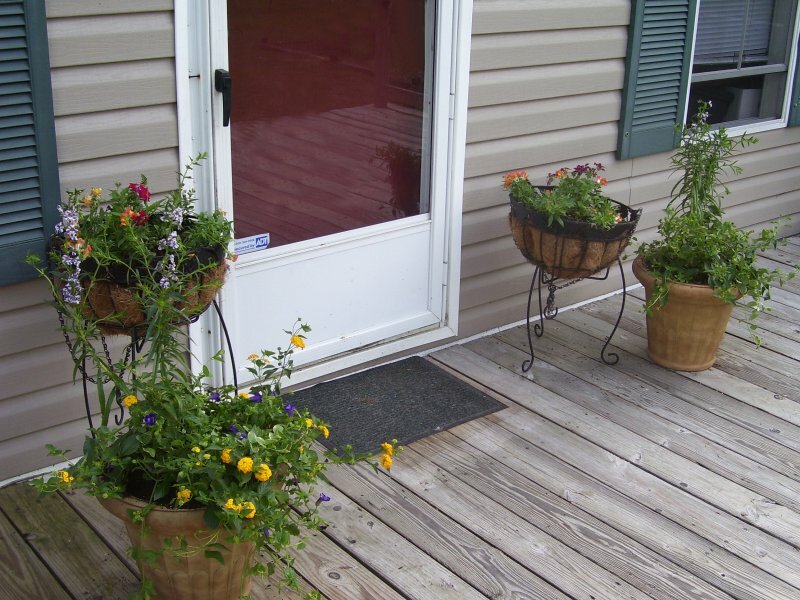 And here are all four of the pots next to the front door. Cheerful! It’s amazing what a little bit of foliage can do. These should last us through November and even early December, depending on how cold it gets. Then we’ll have a month when everything just dies or goes dormant, and I’ll be back at it again in February when the pansies are out and the daffodils are thinking about popping up. I love a long growing season! Amanda Livenwell is the pen name of a stay-at-home mom who shares the adventure of living large on one income in, yes, a double-wide trailer! Join our family as we say goodbye to suburbia, trim down, and start saving to build our own home. We're going to talk about doing it yourself, living beautifully on less, making do or doing without, and counting it all joy in the process. We'll cover prep-work and painting, refacing kitchen cabinets, flooring on the cheap, tiling over laminate, upholstering furniture, and just rolling up our sleeves in general. If you love home improvement, this is the place for you. Let's get cracking! MSM is Frugality Central! Bookmark, visit often, subscribe to the feed, and save! Organic Valley Family of Farms - Get coupons and special offers for delicious, healthy food! The Coupon Mom - Another fabulous source for discounts and freebies! Dave Ramsey will help you break the chains of debt and run to freedom!